With ShurSEAL Packaging Solutions, you can adjust front and rear tabs to meet your individual case sealing needs. Select tape tab lengths from 1.5″ to 3″ to increase or decrease packaging tape consumption as you go. And, tab lengths are easy to adjust*, which allows you to switch your lines and get them back up quickly and efficiently. *Tension adjustment is crucial when changing tab lengths. 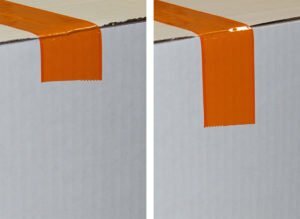 If the tension is too loose, the tape tab length will tend to be long; if the tension is too tight, the tape tab length will tend to be short.